The danger here is not from the sick who are in hospital but from people in the villages who don't know they are have the disease and are coming into contact with other people. The Liberia National Police dispatched officers, with megaphones, in a bid to connect with other persons who may be feeling sick in the area. 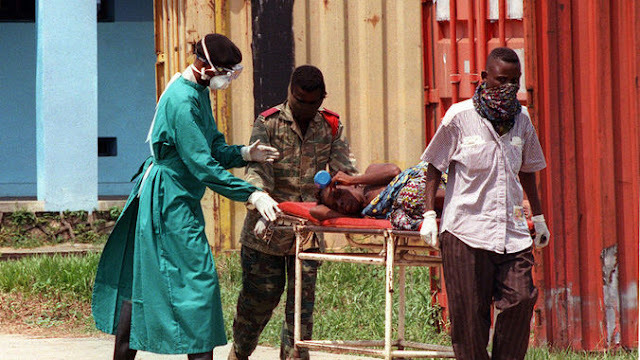 Asked about a new disease discovered in Liberia, Fadela Chaib, for the World Health Organization (WHO), said that on 25 April, WHO had received a report from Liberia health authorities about a cluster of unexplained illness and deaths from Francis Grant Hospital in Greenville, Sinoe County. Sinoe Country is about 4.5 hours' drive south-east of Monrovia. Since April 24, 17 people had fallen sick. Among them, nine people had died, and eight were still ill and hospitalized. Observed symptoms included fever, vomiting, headache, diarrhoea. The response team from the country and the support team from WHO were investigating reports linking the cluster to attendance at the funeral of a religious leader. Specimens had been collected from seven dead bodies and had been sent to the national laboratory for testing. All had come back negative for Ebola. Other investigations were underway, including environment testing, and samples had been taken from water sources, trying to understand what was happening. As a precaution, doctors in the hospital were isolating those who were sick from others. The doctors were required to wear protection uniforms, or PPEs (Personal Protective Equipment) at the hospital. An epidemiological investigation was ongoing well as active case searching (search of sick people in the communities) and contact tracing. There was much social mobilization, encouraging people to go to the hospital when sick, and not to touch the sick or the dead but to leave that to professionals. Samples from water sources were being collected to test for chemicals and other bacteria. In response to further questions, Ms. Chaib said she would check with the relevant department at WHO regarding the age group of those who had fallen sick or died. In notes sent out subsequently, it was specified that most of them were aged below the age of 21. Ms. Chaib would also check exactly on when the nine persons had died and would get back to the press. For the time being, the precautions described above were being taken as the causes of the sickness and death of the people were not known. Rapid response teams had been reactivated at District and County level with technical and logistical support from WHO, the Centre for Disease Control (CDC) and other partners. Ms. Chaib also said Ebola had been a real wake-up call for the international community to put in place mechanisms to be able to detect rapidly and respond rapidly to any events that were not explained. Liberia had been affected by Ebola, hence the particular vigilance. The WHO had learned the lessons of the Ebola crisis and the country, with the support of WHO and CDC, had been able to put in place the rapid response teams. She also clarified that Liberia had activated the networks already on the ground, and for the time being no additional emergency team had been deployed. So far there was no question of quarantine in Sinoe; doctors were just taking precautions when handling bodily fluids and sick people. Asked about why the topic had not been raised proactively by WHO during the briefing, Ms. Chaib said that the issue had been in the media over the whole week and several journalists had already contacted WHO on the topic. WHO had been transparent in replying to those inquiries and had provided the available information. As soon as there would be more information regarding the results of this broad investigation, WHO would be sending a comprehensive "Outbreak News" update. Ms. Chaib also reiterated that the samples had been sent to the national laboratory in Monrovia for testing. She did not know if there was a plan to double check the results in another testing centre.